Luton Town boss Nathan Jones revealed he is hoping to land a new signing this week. 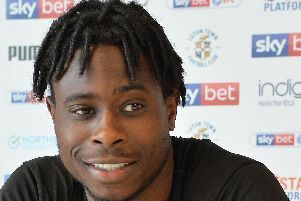 Although the transfer window has passed, the Hatters chief can still bring in a free agent to his injury-hit squad, and will look to do that in the coming days. He said: “We’re hoping to add one which will be a positive for us and then having a full squad as we’ve been light. “We need to add something different with the injury to Eunan (O’Kane) as we’re a body light, which is ironic for us as normally we’ve got a good squad. “We’ve got a few who have done down, Lloyd Jones has gone down, Marek’s (Stech) gone down, both with the same injury, we’ve lost Eunan, (Luke) Berry’s unfortunate, (Danny) Hylton we’ve just got to be patient with.